Transgender men (or trans men for short) are individuals born with female reproductive organs, but who identify as male. Likewise, cisgender women were born with female reproductive organs and identify as female. Both trans men and cisgender women were born with cervixes, and wherever a cervix exists, the possibility of cervical cancer exists. The biggest threat to cervical health is human papillomavirus, or HPV, a virus that is transmitted through a wide variety of sexual activities. If you are, or have been, sexually active and have a cervix, it is important to be screened with regular Pap tests. When caught in its precancerous stages, cervical cancer can be avoided. The Pap test has been credited with plummeting cervical cancer rates, but in the United States, more than half of people who are diagnosed with cervical cancer haven’t had a Pap test in the past five years — or ever. Since cervical cancer is so preventable, it’s of the utmost importance to reach populations that are less likely to seek this lifesaving cancer screening. Some health care providers are uncomfortable serving trans patients. Likewise, trans patients are more likely to encounter discrimination and insensitivity when seeking health care. Some trans men feel a disconnect between the reproductive organs they were born with and their gender identity, and a Pap test can be traumatic or anxiety-inducing. Trans men might not perceive themselves to be at risk for HPV or cervical cancer, and would therefore be less likely to seek screening. Insurance might not cover Pap tests for trans men. Testosterone therapy can cause vaginal and cervical atrophy, which could make a Pap test more painful. Some trans men who have had their uterus removed might still have their cervix, but not be aware of it — there are different types of hysterectomies, some of which leave the cervix intact. Pap tests are very effective in catching cellular abnormalities before they turn into cancer, but they’re not perfect. 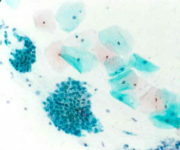 Sometimes, a Pap result is “inadequate,” which means the laboratory didn’t receive enough cells to evaluate the sample. Unfortunately, compared to cisgender women, trans men have eight times the risk of an inadequate Pap result. The atrophy caused by testosterone therapy might be the culprit. An inadequate Pap result requires a repeat visit, but trans men take about five times as long to return for a follow-up test compared to cisgender women, which could lead to higher risk of developing cervical cancer. Because testosterone increases the likelihood of inadequate Pap results, trans men initiating hormone therapy might want to have a baseline Pap test. Anyone who finds the prospect of a Pap test anxiety-inducing can talk to a provider beforehand about strategies to reduce anxiety and trauma, and can bring a trusted friend to provide support during the exam. At Planned Parenthood, health care providers strive to develop a trusting relationship with their patients, which is the first step in reducing anxiety. Patients can also request pediatric speculums to decrease discomfort, are encouraged to find positions that decrease discomfort and the length of an exam, and can use mirrors to observe the exam if it makes them more comfortable. And, before committing to an exam, they can schedule an initial “get to know you” visit to meet clinicians and discuss procedures, expectations, anxiety-reduction techniques, and any other issues or questions. What is the prevalence of Pap testing and cervical cancer among trans men? How can health care providers help trans men receive Pap tests while minimizing distress? Can we reprocess Pap samples or test for HPV DNA instead of requiring patients to repeat a Pap test? Can trans men apply estrogen cream before receiving a Pap test to decrease risk of an inadequate result? Are there less invasive methods patients can use to collect samples for HPV testing? These questions are just a smattering of those that need to be investigated to better serve the health of trans men — and if researchers are limited in the language they can use when seeking budget approvals, answering these questions might be that much more difficult. Planned Parenthood health centers offer both lifesaving Pap tests and the HPV vaccine, and provide care to all patients regardless of gender identity to ensure everyone is able to protect their sexual and reproductive health. Planned Parenthood covers transgender care, including sexual health assessments, wellness exams, cervical cancer screening, STD testing and treatment, contraception (including methods to stop menstruation, if desired), as well as PrEP and PEP for appropriate patients. Prospective patients can also look for trans-friendly doctors in the GLMA provider directory. This entry was posted in Cancer, LGBTQ, Men's Health, Sexual Health and tagged androgen, anxiety, cancer screening, CDC, Centers for Disease Control and Prevention, cervical cancer, cervical health, Cervical Health Awareness Month, cervix, discrimination, gender dysphoria, gender identity, gender spectrum, health disparities, health insurance, hormonal therapy, hormone therapy, HPV, human papillomavirus, hysterectomy, LGBT community, Pap smear, Pap test, Pap testing, Papanicolaou test, results, STD Awareness, stigma, supracervical hysterectomy, testosterone, total hysterectomy, trans, trans man, trans men, transgender, transgender men, transgender rights, transphobia, trauma by Anna C.. Bookmark the permalink.